Flachau is a village in the Pongau region of Salzburg, mostly known as a skiing town. Flachau is the hometown of Hermann Maier, who won 54 skiing world cups until he retired in late 2009. 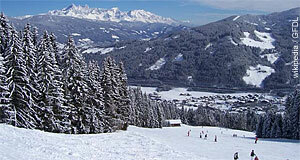 The village has a total population of 2,600, which is a rather high number for the area and for a skiing town. Flachau is part of the Salzburger Sportwelt, an association of ski lifts that seeded the formation of the Ski Amade skiing region. The latter is now one of the biggest skiing areas of Europe. Needless to say, winter tourism is key to the economy of Flachau and the many hotels and restaurants have strongly altered the village character of the community. Until well into the 19th century, Flachau was among the most important areas within Salzburg in which iron ore processing was done. Like in many places in the province′s Alpine south, mining and agriculture were the main employers in and around Flachau. Today, laymen generally won′t recognise any of the mining traces - most of the procession buildings were dismantled and many of the entrances to the old mines were closed or are overgrown. For sightseeing, you should rather concentrate on the village centre. Note the parish church of Flachau, built under the rule of Prince Archbishop Franz Anton von Harrach. Its main altar contains a painting by the famous artist of Austrian Baroque, Johann Michael Rottmayr. There is also a local castle, called Schloss Höch. This castle was built on foundations from the 11th century, but its current appearance is mainly due to modernisations from the Renaissance. There are a hand full of old farm houses and other old buildings that are worth noticing. According to legend, the tower at the Thurnhof was where Salome Alt found refuge when she tried to escape from Salzburg. The early 17th century mistress of Prince Archbishop Wolf Dietrich von Raitenau fell victim to a struggle for power in Salzburg. Once the Prince Archbishop had built Schloss Mirabell for her, now she left the country via Flachau and ended her days in rather humble circumstances.